Nippy forward Manoni Paria (pic), student of Duria Niharkanta Madhyamik Sikshakendra, struck the only goal of the match. 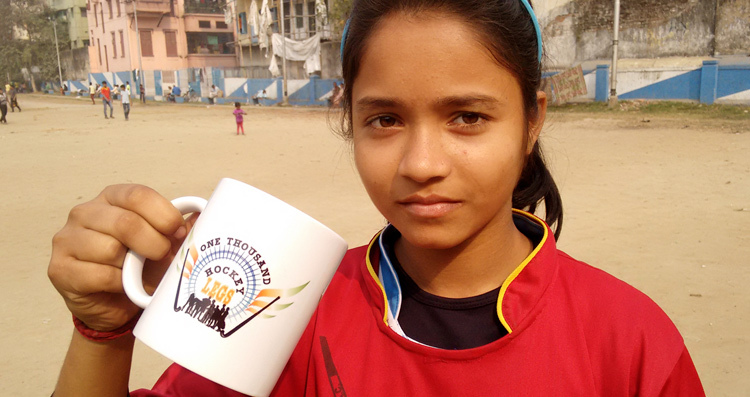 In order to encourage schools hockey, Hockey India has so far given affiliation to two school based teams, Delhi based NGO Hockey Citizen Group's (this NGO runs widely acclaimed One Thousand Hockey Legs Project) and century old Mumbai Schools Sports Association. OTHL is being run five cities - Delhi, Chennai, Puducherry, Kanpur and Kolkata since 2008. Since the Nagaon is close to (though 15 hrs train journey) Kolkata, the NGO decided to send a combined team from Kolkata. Though OTHL has been taking part in the Sub-Junior Nationals for the last two years, its first time girls too entered the fray. Citizen Hockey XI team is in Pool A, clubbed with teams from Bengal, Himachal and Kerala besides today's loser Mumbai Schools Sports Association. The present team is trained by Nashim Uddin and managed by Shukla Ghosh, under the overall guidance of OTHL volunteer Imran Azad. The team: Bera Sudeshna (gk), Khataun Harjeera, Shree Juma, Dasmal Dipshika, Modi Monisha, Chakrabarti Rima, Soren Safali, Malik Priya, Sheilk Sarmina, Dasgupta Megha, Ghosh Sirsha, Namoni Pariya, Shaw Hritika, Dutta Riya, Parveen Ayesha, Das Hiramani, Das Anuradha, Das Sujata. Coach; Nashim Uddin Manager: Shukla Ghosh. Developing sustained passion for Hockey by introduction of Hockey to pre and early teenaged children and simultaneously promoting playing sport as a culture and tradition, thereby contributing to develop a sports loving society. © 2018 onethousandhockeylegs.com. All rights reserved.